Can the IoT drive energy harvester adoption? Home > Energy Harvesting > Can the IoT drive energy harvester adoption? A broad term referring to applications as diverse as internet connected vehicles to consumer electronics such as smart phones, the Internet of Things (IoT) adds connectivity. In order to provide the identification of objects, sensing, control and automation, the edge of the IoT network consists of simpler sensors and wireless devices. Potentially the highest volume of all devices and at the lowest price points, adding power to the simplest, passive RF devices, with relatively short range, enables more functionality such as sensing, mesh networking and automated control. Yet, the return on investment (ROI) of many wireless sensors in different applications depends upon the lifetime of the device - usually a function of the battery lifetime. For example, a device lasting ten years versus two has a dramatic change on the ROI calculation, especially if the sensors are embedded in devices adding significant labour cost for battery replenishment. Despite the challenges of moving these to market, energy harvesters can help. One challenge facing energy harvester adoption is the short term cost: a primary battery costs less than that of an energy harvester and associated interfacing electronics. The energy harvester version may well be cheaper over the life of the energy harvested powered device, however, buyers may be incentivised by the low upfront cost of batteries without taking into account the long term costs. Additionally, there are batteries which last for longer periods of time, particularly as the energy requirements of circuitry falls, but these batteries usually command a premium price. These challenges can be addressed: enhance end user knowledge about the capabilities of energy harvesting technologies and cost over time; and provide case studies of energy harvesting powered wireless sensors, showing payback versus others. End users are more likely to adopt the technology if it is proven. Widespread publicity of the IoT will help to gain recognition for wireless sensors and how they can add value, increasingly using energy harvesting as a power source. 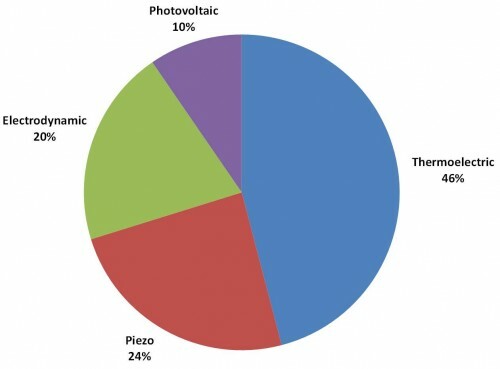 The chart, below, shows the adoption of small scale energy harvesting, across all applications, by value of the energy harvesting component alone. IDTechEx foresee the energy harvesting market by component reaching $596m (USD) in 2018, up from $163m (USD) in 2014. Hosted by IDTechEx in Berlin on April 1-2, case studies and end user needs and requirements are a critical element of this year's Energy Harvesting & Storage Europe conference. Co-located for the first time with the Internet of Things conference, the event allows organizations in each sector to meet. Companies such as Arup, ABB, GE and Bosch will provide market and case study insight. Attendees to Energy Harvesting & Storage Europe can attend the Internet of Things conference sessions as part of their ticket. How can digitalisation support energy transformation? Why does Smart Metering need next‑gen cellular technology?